It is that time of year to gather and celebrate with friends and family. In homes along the Gulfcoast, the sunroom space becomes a natural gathering area for get-togethers. A sunroom can enhance your entertaining in a variety of ways. Foremost, sunrooms bring additional living space to accommodate a larger number of guests. With full glass views of the outdoors, your friends and family will be able to enjoy the outdoors from the comfort of your home. To feel snug and warm, sunrooms can be heated with a heat pump thermostat. Plus, the natural light brings a warm glow into the home — making it an inviting place during our chilly winters. After a big meal, kids can play outside in the yard, providing parents a perfect view from the sunroom. Majors Home Improvement can design a custom sunroom with your aesthetic needs and budget in mind. Are you considering this elegant addition for your home? 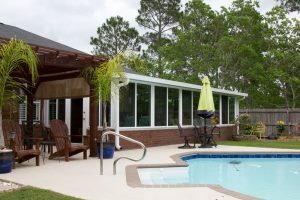 Click here to read more about benefits of a sunroom or enclosure. Schedule your free consultation here.